What did you think of The Royal Ballet's Mixed programme featuring works by Ashton, Marriott and Robbins? Beautiful work from #ROHDream fairies tonight, but much audience dismay at Titania's garish wig. Own hair so much better, blonde or not. I do so love #ROHdream: am Very Fussy Indeed about AMND but I like this & @_stevenmcrae meets my exacting standards (set age 4) for Oberon. Excellent Pucking from @paul5kay in #rohdream tonight - oozing spirit and musicality. Younger Pucks could learn a lot from watching! Just finished seeing @TheRoyalBallet new triple bill. The standout is #ROHconnectome Nothing like #Tectractys thank God. Happy. #ROHconnectome looks stunning & is v moving. Bit too much writhing on the floor for me. Bravo for Vasko Vasiliev's magnificent violin solo! #rohconnectome The best new work by #royalballet in years! Stupendous combination of choreography design and music! Truly brilliant! #ROHconcert was hilarious! I wasn't sure that ballet could be funny - Robbins thought otherwise. Thank god! #ROHConcert was the most bonkers ballet I've ever seen and I loved every minute of it (especially the butterflies)! I learnt that the seemingly recent trend of getting the dancers to use their voices is at least as old as #ROHConcert. What did you think of The Dream / Connectome / The Concert? The Royal Ballet's triple programme of The Dream, Connectome and The Concert runs 31 May–13 June 2014. Tickets are still available. It is worth waiting to see the Concert for 13 years. Enjoy all three pieces which contrasted well. The set design in Connectome was very clever (particularly the projection of the singer) but just gets too distracting. Wonderful pieces! So glad I went! Don't know how they were all connected but the dancers skills were utterly amazing. Loved Macrae and Marquez in The Dream and the costumes were to die for. Loved the energy of Connectome but the lights were annoying after about 1 minute and someone said re the costumes, "They are dancing in their underwear". I thought that too, but didn't say it out loud! Loved The Concert one of the most unique and funny pieces I have ever seen. Loved Cuthbertson in that. One of her best roles ever. Also Oberon was one of Macrae's best roles ever. And Osipova made Connectome fly. I think it would have failed if she had not been so dynamic and perfect in that. Thank you ROH you outdid yourselves. Again like another poster on here said, thank goodness that Connectome was not Tectractys! This was the first time I enjoyed every piece of a triple bill. Perfect. Loved the triple bill and so good to see Sibley and Dowell again; I was at the first night in 1964! I found the lights in Connectome quite off-putting and they made me feel dizzy and a bit sick. Had to keep closing my eyes - not good to see ballet. Dancing superb all round. An evening of memorable contrasts and excellent dancing at a knockdown triple bill bargain price. McRae was excellent in Dream which I, too, saw fifty years ago and it was good that Sibley and Dowell were received with such warmth at their curtain call. The Orchestra could add to Bottom's character by playing the 'donkey bray' orchestrations as they used to. Marquez brought out something I had never seen before when, at the end, she recalls her dream/adventure with a beguiling mixture of regret and remorse. 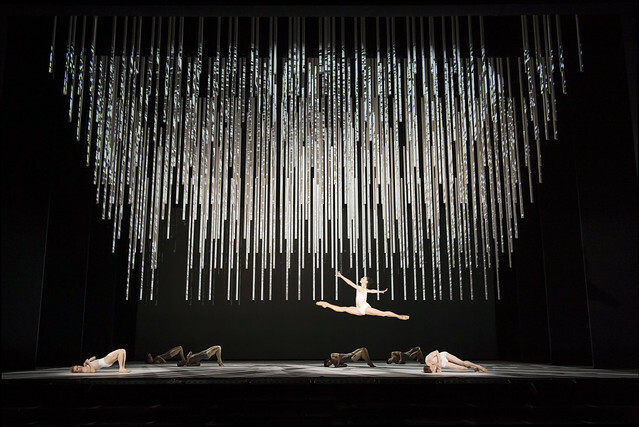 Connectome was intriguing - not least in its choice of score: the marriage of human emotions and cerebral functions was etched clearly and executed superbly by Osipova, McRae and all. The last section was like hearing Mahler's 'Nachtmusik'' from Symphony # 7 re-assembled in an altogether new and magical way. The video projections were a tour de force in their own right and may soften in their impact with repeated viewings, but on the first night often proved an unnecessary distraction. In Row D of the Stalls I was frustrated at the lack of complete visibility of dancers' feet and missed some of the groundwork due to the layout of that particular area of the auditorium: fine for opera, but disappointing for ballet - especially when Bottom's toe-dancing was unable to register completely. The Concert was appealing danced and the laughs were still there - even more than I recall from the pianist - and with the audience throwing PC to the winds by laughing at the bottom-patting during one episode. (How times have changed - he would be up for sexual harassment these days!) Fine programme notes added to the enjoyment of the evening and were essential reading for Connectome: on a previous visit (my first time to the engrossing Sweet Violets), I was completely at sea without guidance. Before the renovation of the Opera House, my favourite,seat was,front row,stalls. But since then either the floor of t auditorium has been lowered, or the stage raised and it's impossible to see the lower limbs and feet of dancers. If Row D has,the same problem it seems to me that the seats,should be sold as restricted view. Seeing the programme tomorrow - from stalls circle! Superb dancing throughout was overshadowed by the degree of contrast between the three pieces which left me with a feeling of disconnect. ..or have I missed something? Thank you for a superb triple bill. I very much hope that Connectome will stay in the repertory - I found it very beautiful, moving and visually stunning. I saw this accompanying my son's school trip. The children responded with great exuberance, especially to the Concert, though when I asked them, most of them liked the Dream best. I loved Connectome the best. Totally mesmerizing. I wish I could see it again but I see it is all booked out. Superb contrasting programme - I have only ever seen one ballet at a time but I would definitely choose a mixed programme for myself in future. LOVED the mix! Was so refreshing. Thank you! In "The Dream" who were those people with mobile phones in the wings? What were they doing there? Utterly bizarre? Can't somebody be bothered to clean the floor before a performance?? I have passed your comment on to the Front of House team. Apologies if you found the auditorium less than clean and tidy. Sorry. I didn't mean the auditorium. I meant the stage. The flooring is covered in scuff marks. Half the audience are in the amphitheatre and they are looking at the flooring on the stage. It seems that nobody goes over it with a mop before the next performance. In the stalls it doesn't show but in the balcony or the amphitheatre, it really doesn't look good. Actually, do the Ballet, Opera staff view the performance from different parts of the theatre? In the auditorium for the Te Deum in Tosca, you are looking at feet. In La Somnambula, the chorus in the balcony on stage were completely invisible for the audience in the amphitheatre. Thanks. I saw this delightful mixed programme on its opening night and found all three parts really exciting. Then I was there again on Thursday 12th June to see it with a different cast list. Again, I enjoyed it immensely, but I must mention an incident which drew a wonderful spontaneous burst of applause from the audience! ......... Matthew Golding was 'Oberon' in "The Dream", and late in the performance his coronet came loose and eventually fell onto the stage. Many in the audience wondered if it might cause an accidental slip. Then, a few seconds later, Valentino Zucchetti (a delightful 'Puck'!) came back on stage and, without missing a step, neatly toe-flicked the errant coronet into the wings and safely offstage!! I would commend him to the Italian team in the World Cup - or perhaps he might get a place in the England team if he has Dual Nationality??!! Well done, Valentino!! A wonderful performance and a skillful 'goal' ! !